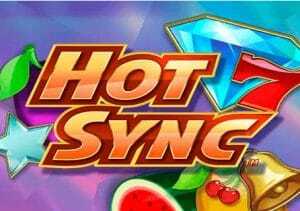 If you enjoy classic fruit machines that offer sky high variance then Hot Sync should certainly pique your interest. Created by Quickspin, it’s a 5 reel, 20 payline video slot that comes with respins and free spins with synced reels and plenty of added wilds. Play on all devices from between 20p and £100 per spin. There’s a fresh, glossy sheen to the design in Hot Sync. You’ll see cherries, lemons, plums, melons, bells, stars and lucky red 7 symbols spinning around the reels. The best paying standard symbol is the white diamond which awards 25 times your total bet if you land 5 in a line. More rewarding still is the gold wild which will get you 2.5, 12.5 or 50 times your bet if you land 3, 4 or 5 on a line. There are 2 main extras on offer in Hot Sync. Hot Sync Respin feature – these are triggered by landing 2 or more Hot Sync Wilds on the same spin. Extra wilds are added to the hot reels that contained the Hot Sync Wilds from the triggering spin on the respin. The hot reels are synced and contain the same matching symbols too. The respins continue as long as no new Hot Sync Wild lands. Free Spins feature – this round is activated by landing the bonus symbol on reels 2, 3 and 4 on the same spin. You’ll then receive 8 free spins. Any Hot Sync Wilds that land here turn that reel hot for the duration of the free spins with plenty of extra wilds added. The hot reels will show the same matching symbols too, making it much more likely you’ll create a winning combination. Simple this game might be it’s also extremely volatile. You can expect lengthy spells when you’ll just miss out on triggering the bonus feature or even the respins. A good run in either feature can soon get the coins flowing though to the tune of 3,075 times your total bet on each spin! Quickspin has created an impressive video slot here. The visuals have been sharpened up and the feature rounds offer plenty of potential. The sky high volatility means it won’t be for everyone. If you have got deep enough pockets to cope with the potential swings, Hot Sync shows there’s still life in the simple, classic fruity. If you want something more modern, Quickspin has plenty of alternatives with Pied Piper and Northern Sky recommended.